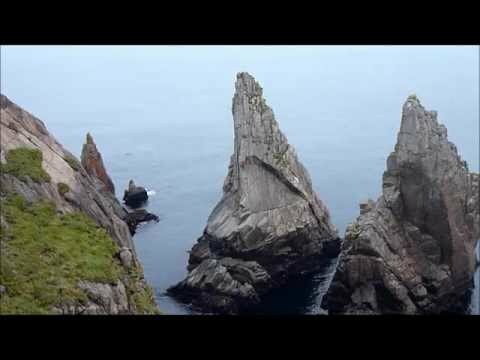 Sitting off the north west side of Tory Island there stands in a row four very impressive 45m sea stacks. From the main pier in the west village where the ferry to mainland Donegal arrives, follow the only road out of the village east. After 1 Kilometer turn off the road and over the moonscape land toward the huge tower dominating the horizon. This tower is clearly and easily seen from main land Donegal, alas it is not a sea stack as it is still joined to Tory Island by a loose and exposed ridge. From the view point overlooking this tower look out to sea as all four of these stacks are in perfect view either side of the tower. For the three stacks to the West of the tower, abseil down to the storm beach facing the nearest stack. From here it is an excellent wee sea crossing to all three stacks. The nearest stack to the storm beach is the right hand of the three to the left of the tower. This 45m stack has a wide groove/narrow chimney in its upper reaches of its land ward face. The stack has two recorded routes to it's pinnacle summit, both are based around this chimney feature. The easier route climbs the chimney direct and continues up the steep ledges above to a perched belay at the edge of the abyss. Descent is by abseil down the chimney. The highest and most impressive of these sentinels is the 45m centre stack. This perfect cone pinnacle stack has been climbed twice by two different routes. In 2009 the sea ward face was climbed by a full stack height aréte. In 2011 the much more impressive and slightly scary looking land ward aréte was climbed at Severe a much more relaxed grade than it looks.